Egnyte, the market leader in Adaptive Enterprise File Services, today announced the launch of their all-new Smart Reporting and Auditing service. 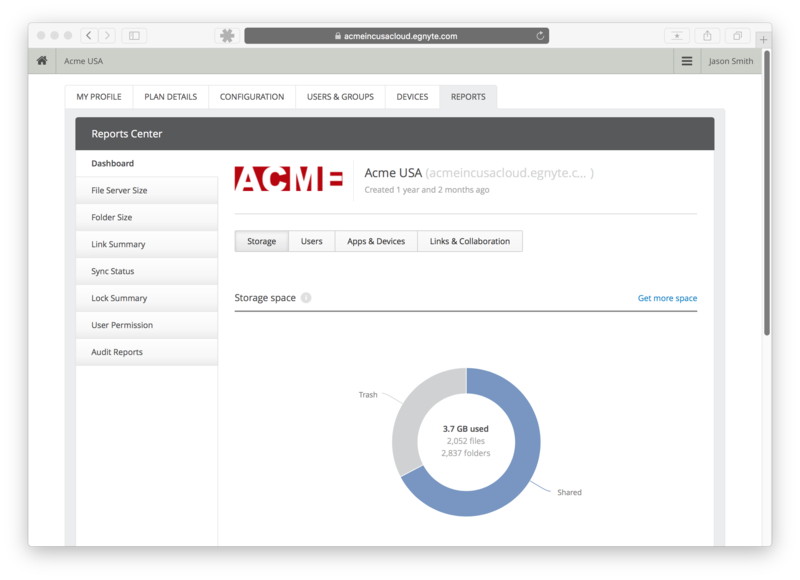 This new service allows organizations to leverage comprehensive dashboards of system-wide analytics around content (creation, editing, viewing, sharing), users, devices, applications, and more to optimize their business’ internal and external data environments. Reduce Cost - Organizations will save money by making informed, data-driven choices about their infrastructure locally and globally — reducing bandwidth consumption, minimizing support issues, and increasing productivity. 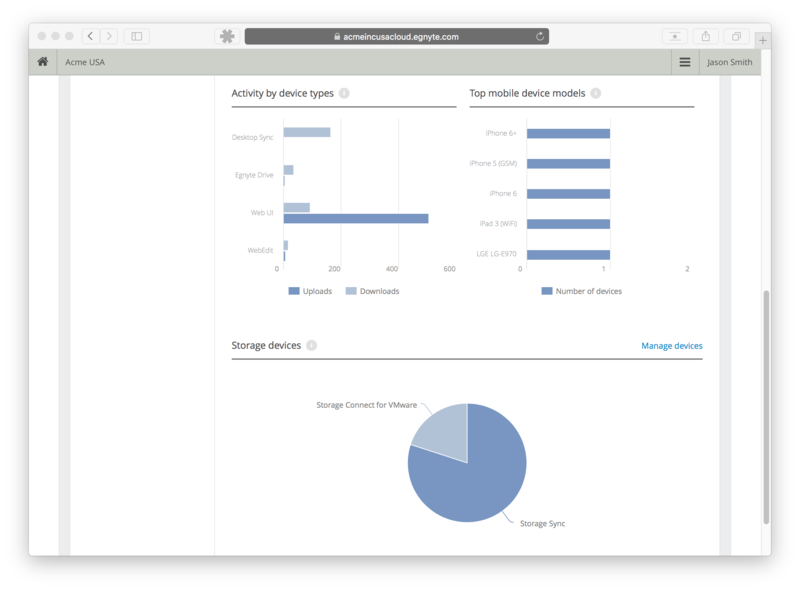 Reduce Risk - IT leaders are provided access to unique insights about user, file, and device activity that can be harmful to their organization. The Smart Reporting and Auditing service helps maintain security and compliance with preventative alerts that notify IT about suspicious activities, internally and externally. Increase Visibility - IT and business users will be empowered to make smart decisions at every level with relevant, viable information that is delivered right to their Egnyte interface. IT will have more visibility into the security and efficiency of their entire corporate infrastructure and users will also gain insight into their usage patterns as well as internal and external collaborative efforts. “Egnyte is making the experience for administrators a little bit easier,” said Patrick Aitken, director of sales and business enablement at Marin Software. “The Smart Reporting and Auditing service is a game changer from an admin point of view. 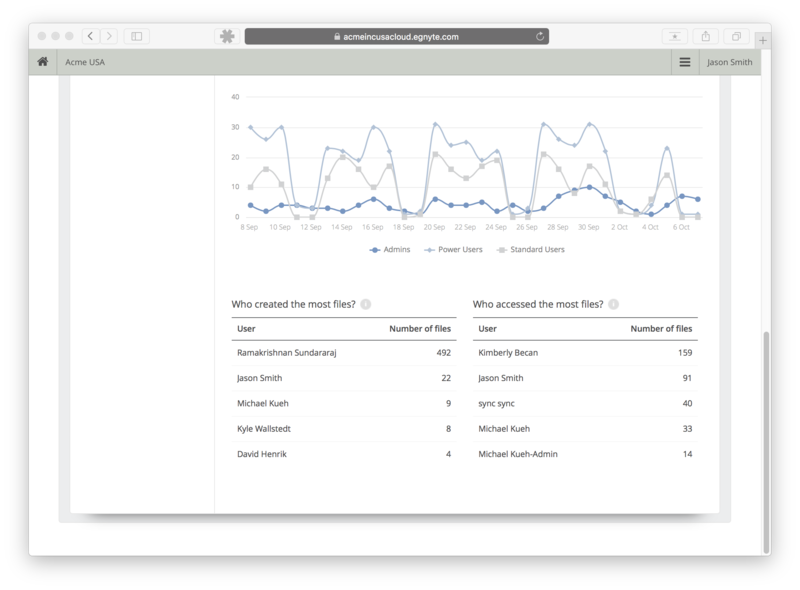 You’re able to look and see file analytics, as well as user statistics, internally and externally. 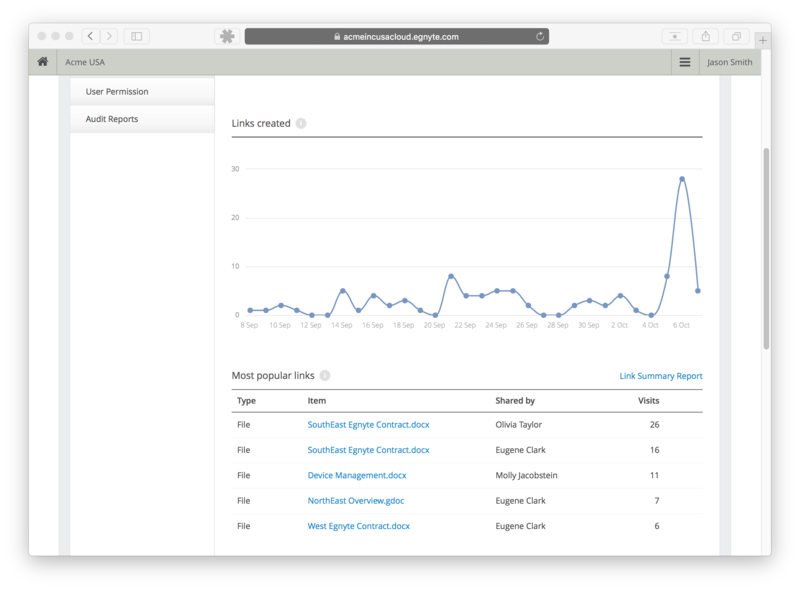 I can easily login and check out regions and activity on links to monitor the effectiveness of content our teams have shared and understand which files are being accessed and by whom."